Storer Transportation School and Contract Service is currently accepting applications to establish a list of qualified candidates for this position. 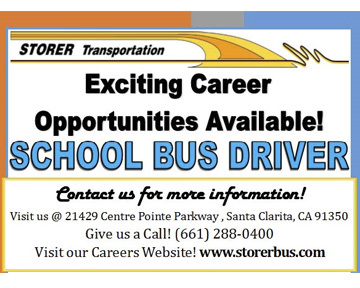 School Bus Drivers are hired for split shifts to transport children to and from various locations throughout the Santa Clarita area. Schedules, hours and length of assignments may vary. DOJ & CHP Fingerprint clearance, DOT physical exam and DOT drug screen are required prior to employment. Provide safe transportation of students to and from school throughout the Santa Clarita area. Provide direct/indirect supervision of all students while entrusted to your care. Maintain close communication with Storer Transportation staff and District Staff. Collaborate with the District and STS office in students sealing assignments. Storer Transportation policies and procedures applicable to assignment. Hart/Newhall Transportation Conduct Code, Rules and Guidelines. Pass all DMV & CHP driving proficiency tests required for a commercial driver’s license, class B-P, and a California Special Drivers Certificate (School Bus Drivers Certificate) with appropriate training. Physically assist in the lifting and moving of students as is appropriate to their specific needs. Facility to sit in a school bus, a desk, conference table or in meeting rooms of various configurations for varying amounts oftime. Facility to walk on uneven teiTain, school grounds and school buses. Physical ability to lift and carry from 40-60 pounds, as well as bend, stoop, walk, reach overhead, and stand as many as four hours per day. Physical agility to push/pull, squat, twist and tum. 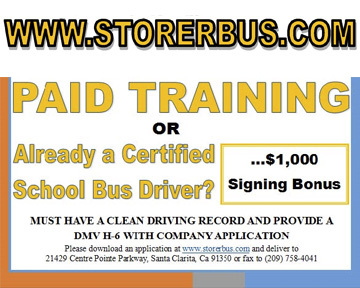 Documents Required: Storer Transportation Driver Application and a copy ofthe applicants 10-year (H-6) driving record from the DMV, dated within the last 14 days, are required at time of application. Applicants who do not submit a complete packet may be disqualified.